Centrifugal hydraulic classification is used by these appliances to separate particles. These appliances consist of a cylindrical conical housing in which a tangential feed mechanism causes the water to rotate before it is discharged from an axial overflow nozzle (figure 8). Concentrated sludge is discharged through the point (underflow). 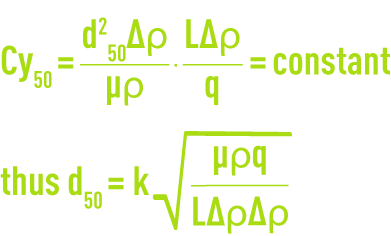 In the smaller units, centrifugal acceleration can exceed 600 g and supply pressure will fluctuate between 0.5 and 2 bar. The separation characteristic d50. expressed in general in mm and wrongly termed filtration capacity, relates to the diameter of the particle providing 50% separation. Construction is characterised by the housing diameter D, the length L/diameter D ratio, diameters e for the intake opening and s for the outlet opening, and the angle at the apex, a.
Δp: Differential pressure in the appliance. Through experimentation, we establish the differential pressure variation Δp based on the through flow. Two groups of equipment are used. Their diameters range from 150 to 800 mm for processing throughputs of 20 to 250 m3 · h–1 with d50 values for grit of between 50 and 80 mm. They are protected against abrasion and can be used with lightly concentrated sludge suspensions, otherwise their removal capacity rises rapidly (see effect of h). SUEZ Oil&Gas Systems designs and builds such equipment specifically for the petrol industry where this equipment is widely used for separating oil from water and for the removal of heavier particles (sand). For processing higher flow rates and for grit removal from lightly laden water, very small diameter, pressurised cyclones can be used, often grouped in parallel within the same housing, with the possibility of achieving a lower d50 (10 µm). These units have diameters measuring a few centimetres and are constructed of anti-abrasion plastic materials. Their pressure drop ranges from 1 to 2 bar. Infeed must be carried out after suitable straining.